And it’s worked. Like many of you, I’ve been more likely to purchase from a brand when they feature black women in their marketing and make it a point to ensure dark shades are available for purchase as soon as a product launches. Two years ago I wrote about a popular makeup brand’s failure to provide testers for dark skin consumers. The brand essentially told me it wasn’t their problem and provided me with a $20 gift card. This same brand recently partnered with a celebrity Youtube vlogger and debuted a new foundation featuring a diverse shade range. And from what I’ve seen in stores, they provide plenty of testers in all skin tones. On some levels, progress has been made, right? They have more shades, they have partnered with a black vlogger, and now they have even more testers available. It makes sense, too. They recognize the power of the black dollar. But here’s the real tea. This so-called inclusivity only goes so far. As someone who writes about beauty and creates beauty-related content on my social media platforms, I’ve had the privilege of having a seat at the table with many of the major brands we know and love. They’ve had coffee with me. Taken me out to dinner. Picked my brain, if you will. But that’s where it ends. While they are creating products for black women, when I sit down at these meetings I don’t see black women. Black women are not behind the scenes handling these marketing campaigns. They aren’t on the public relations teams. They aren’t in the room when decisions are being made to determine how they will feature us in their marketing campaigns. I’ve been creating content for almost 7 years. Brands will gladly send me makeup samples, which I’ll then use to create content marketing those products. I’ve spent countless hours and resources creating this content under the impression that a. these brands really care about the black consumer and want to see us in their products and b. because I want black women to feel that we can wear makeup. But we’re being used. Brands are pandering to the black consumer, making it appear as though they are inclusive and want us to be a part of the broader beauty community when in truth, they aren’t really hiring black women. Not in their offices, and certainly not for their paid media campaigns. They will even have us at their events, making sure to snap our pictures so it can, again, appear to be inclusive. But don’t expect to see more than one dark brown face at these events. The quota usually only allows for one or two (if we’re lucky). I can also say with almost absolute certainty that if we looked at their books we would notice the gigantic discrepancy between how many white women they have on payroll versus the black ones. And the ones they do pay, more often than not, are simply filling a quota. Not only that, when it comes to social media campaigns they are hiring the same 10 faces over and over again. These token black women are usually a part of the elite 1% of black bloggers and beauty gurus who have a million or more social media followers. And from a business standpoint, it makes sense, right? Why shouldn’t they employ the best of the best to help push their products, right? By continuing to hire who they’ve decided is the best of the best and continuing to prominently feature these same 10 faces, they are, in essence, setting the standard of beauty for us. If these 10 women, as lovely as they are, are goals for black women, what about the rest of us? How can this handful of women successfully carry the burden of representing the entire black makeup-wearing community? If millions of us regular degular black girls are pouring billions of our dollars into these brands, shouldn’t a few of those dollars go back to black women? Shouldn’t more have a seat at the table? How can they claim inclusivity if they only value the elite 1% of creators, and feel no onus to also hire black women to be a part of your PR and marketing teams? Furthermore, by having the majority at the helm, making decisions without input from the larger black beauty community, black consumers are being fed what they’ve decided represents us. And when white folks are choosing us, they select the folks who, for reasons only they know, feel safe. They may say they select us based on merit, but that’s only partially true. They select folks who do not ignite their inherent biases. And by selecting only these people, who, as we see, make up an extreme minority of black beauty consumers, these brands are controlling even our own perceptions of black beauty. It’s no secret that we’ve also made a habit out of feeling validated when we are chosen by them. So these chosen ones are often so consumed with keeping their position that they don’t feel compelled to pay it forward. Indeed they’ll argue that we should pull ourselves up by our bootstraps like they did. That we should work harder. That we suffer from feeling entitled to being “put on” by our brothers and sisters who’ve “made it.” On the contrary, we, the unchosen, don’t want handouts. We are not unchosen because we don’t deserve it, we are unchosen for reasons rooted in white supremacy. And you are chosen because (unbeknownst to you) you uphold that very system. And to be clear, I do not blame the chosen for the situation we now find ourselves. I am always happy for the chosen, and I always celebrate their wins right along with you. I do not expect that they would or should look out for the unchosen. White supremacy does not allow for that sort of camaraderie. And I know what you’re thinking: stop begging. Create our own. And I hear you. Now more than ever, I realize that I must create and launch a product of my own in 2019. But when it comes to supporting black cosmetics companies, we do. We buy their products and you know I feature them in black-owned lists on this blog all the time, but small companies have small budgets. I’m hoping this changes in the near future, so I will continue to support us however I possibly can. That being said, this post is not about begging them for a seat at a table. In fact, this post will probably ensure I never get a seat at their table. 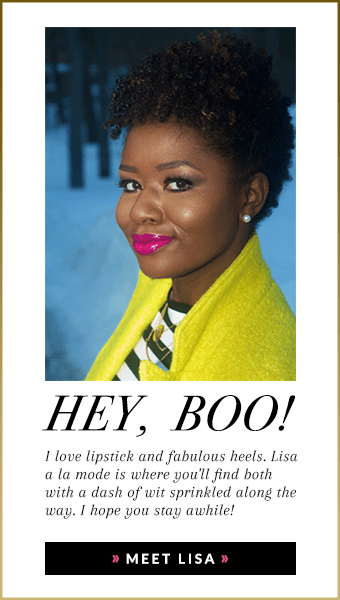 I’m writing this for us, the black women who spend billions on makeup every year. The black women, like me, who have been conned into believing that by supporting “inclusive” brands, more black women are being given opportunities and coins. We aren’t. It’s a charade. Stay woke, sis. That’s all. I’m so glad that you were able to take the Instagram Live conversation that you were having a couple of days ago and articulate it into this super timely and appropriate article! You are speaking out on what many of us in the industry already feel! I would like to take this offline and discuss my experience with you working as a “senior” multi-lingual black woman for the biggest cosmetics company in the world. I have stories of frustration for days! But please keep speaking your truth. Someone somewhere out there is paying attention. Can you please make this article sharable on twitter? you can share any article on twitter by copy and pasting the URL, or you can click on the twitter share button at the bottom of the post.